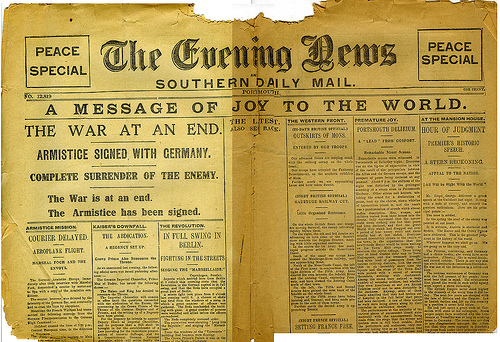 A message of joy: the war at an end. ‘Everyone Sang’ relates Sassoon’s ecstatic— almost religious— joy on hearing soldiers singing, and is a song of praise for the men’s resiliance. Everyone Sang: Communal singing was common in the trenches. Sassoon was an officer in the Royal Welch Fusiliers. Graves notes that whereas in other regiments singing was often limited to music hall numbers, Welsh soldiers sang hymns, often in Welsh. This singing, perfected in Chapel and Church, was often powerfully moving. It is possible that it is this kind of singing that Sassoon refers to. Critics have suggested that ‘Everyone Sang’ describes to soldiers’ reactions to the Armistice (Robert Graves interprets the poem in this way in ‘Goodbye to All That’). Others follow Sassoon’s own account in ‘Siegfried’s Journey’ that the poem is, rather, a more abstracted paean to change and the singing represents ‘social revolution’ (see W. Lawrence’s fascinating comment to this post, above). STRUCTURE: ‘Everyone Sang’ is comprised of two stanzas of five lines length, rhyme scheme ABCBB. “Everyone suddenly burst out singing;”: the “Everyone” of this poem refers to a group of men singing and celebrating. The emphatic description of ‘everyone’ singing captures the broader tone of celebration of the human spirit that this poem contains. “I was filled with such delight / As prisoned birds must find in freedom”: the conventional symbolism— that of a freed, flying bird embodying the human spirit— nonetheless captures the sense of release that the singing brings. “Winging wildly across the white / Orchards and dark-green fields;”: the alliteration introduces a wheeling rhythm to the end of the stanza, until we gain the perspective of the freed bird, looking down on the countryside below. There is a real sense of the expanding horizons that the singing- and coming of peace- brings. “on— on— and out of sight.”: a ponderous and deliberately slowed passage that reintroduces the listener as one gazing out at the freed bird as it flies away. “Everyone’s voice was suddenly lifted;”: Repeating the literal phrasing of the poem’s first line, the beginning of the second verse is both literal and metaphorical. The voices sing higher and louder, but the ‘lifting’ of the voices here also suggests elevation here— a transcendental tone. This metaphor of “lifted” voices logically follows on from the prior image of flight. “beauty came like the setting sun:”: Sassoon again uses conventional imagery, here that of the beautiful, setting sun. Sassoon uses a language here that in other hands might seem hackneyed or clichéd, but manages to convey a purity of experience. The simpler and more archetypal the imagery, perhaps, the better to evoke the emotional power of the singing men. The “setting sun” here suggests death, sublime beauty– and an end. “My heart was shaken with tears: and horror drifted away…”: the emotional and spiritual power of the song moves the listener so that their worst thoughts and memories of the war “drifted away”. Through the singing they escape the war and rediscover their common humanity. This lifting of horror, like mist or fog, is captured in the pause denoted by the ellipses. “O, but Everyone / Was a bird;”: the suggestive capitalisation of “Everyone” here seems to suggest that ‘everyone’ in the poem have for a short while have assumed the freedom of transcendence, of becoming more than themselves. Note the building intensity in this verse, as sub-clause follows sub-clause, leading to the cry of ‘O’, and sense of profound emotional release in the last two lines. “and the song was wordless; the singing will never be done.”: The sense that the listeners experience is sublime and timeless is profound; moving beyond words, to suggest here a religious image of the eternal singing of men. A-level meetings! Excitement and intellectual thrills. 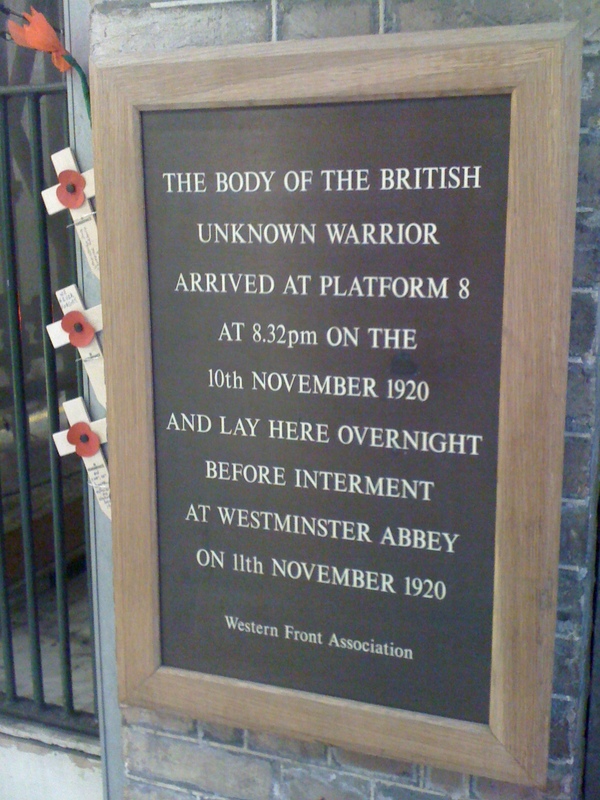 Further to my post on the 10th about the journey of the Unknown Warrior to his tomb in Westminster Abbey, it so happened that I wandered through London Victoria train station last week. There, next to Platform 8, I found the plaque erected by the Western Front Association, commemorating the arrival of the Unknown Soldier’s carriage. Further along the railings, poppy wreaths had been lain by a number of different associations- from Tube and Train Drivers Unions, various army regiments, the British Legion, and even a Jewish servicemen’s organisation. It was interesting to see the buffers that met the end of that famous journey. The Western Front Association has an interesting site with articles about the recent remembrance ceremonies, the Battle of Loos, Churchill, instructions in how deal with gas attacks, amongst others. It also has an article on the Victoria ceremony this year, here. They say that there is a First World War memorial in just about every city, town and village in Great Britain. Within those cities, towns and villages, there will often be more than one place set aside for reflection on the sacrifice of the dead. There are memorials that go unseen by casual eyes: in churches and cathedrals to dead parishoners, in town halls, post offices, schools. Here at Southfields we have our own First World War memorial, and it’s one of the more beautiful modern memorials that you’re likely to see. A few years ago some of our younger art students were encouraged to make tiles depicting scenes and symbols of the First World War. 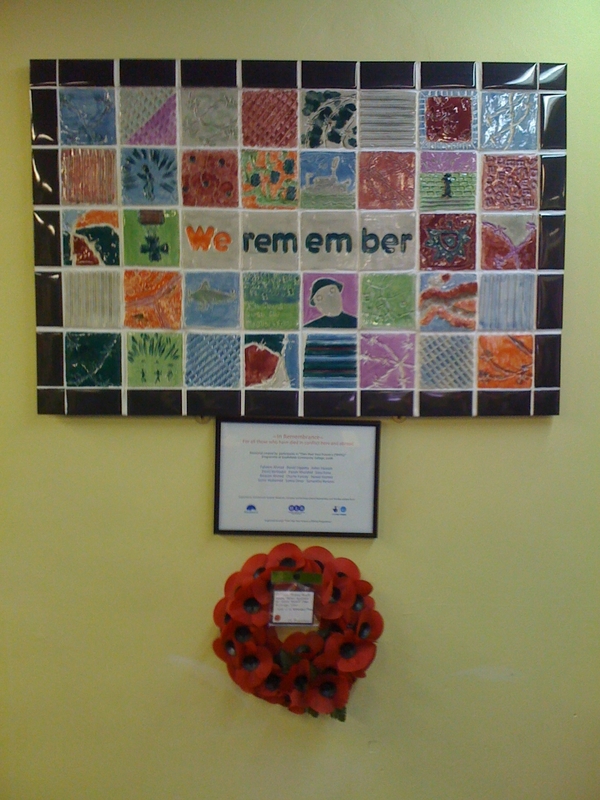 They made brightly coloured tiles of poppies, soldiers, trenches, airplanes and pressings of barbed wire and iron. They coloured these and gave them a beautiful glossy glaze. Finally, they constructed a tableau out of the different elements, arranged around the words, ‘We Remember’. My picture really doesn’t do the bright simplicity of the arrangement justice: you can see it in the college’s reception hallway. It’s a favourite part of the school buildings. The Southfields War Memorial, made by our own pupils. Today the school stopped for its minute’s silence which, as usual, was observed impeccably. History classes lead up to Armistice day and our pupils are well informed about the reasons for observing the silence and respecting the dead. Remembrance Day at Southfields also takes in those affected by many of the contemporary wars that have ravaged the planet, and too many of our pupils have been forced from the lands of their birth by conflict and death. Remembrance Day is not an abstract moment of reflection for some at our school. The war memorial at the very entrance to our school seems to commemorate that. 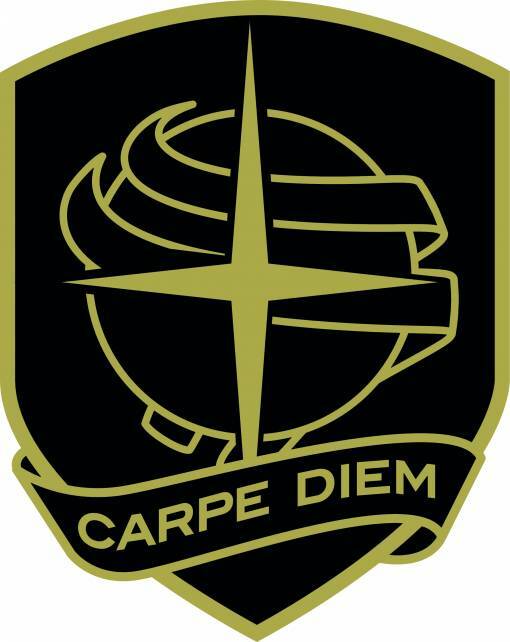 My AS class met today and together we read about the Tomb of the Unknown Warrior (see my post yesterday), watched a film of the coffin’s passage from France to Westminster, and the discussed the last days of the war. Then we read extracts from Max Arthur’s excellent ‘Forgotten Voices’, the words of those who knew how it felt on the 11th of November 1918. We were stunned. I had been out since 1914. I should have been happy. I was sad. I thought of the slaughter, the hardships, the waste, and the friends I had lost. The discussion we had about these feelings was perceptive and, for me, moving. At the end of the lesson, the class and I (well, half of the class at least– the rest were on a trip) went down to visit our memorial and allow me to take a photograph. It’s not a solemn picture, and that’s as should be when your English teacher keeps messing up with his camera. The Southfields AS English Literature class, sharing a moment. Left to Right: Solomon, Toni, Jarry, Aakanksha, Abdul and Ryan.